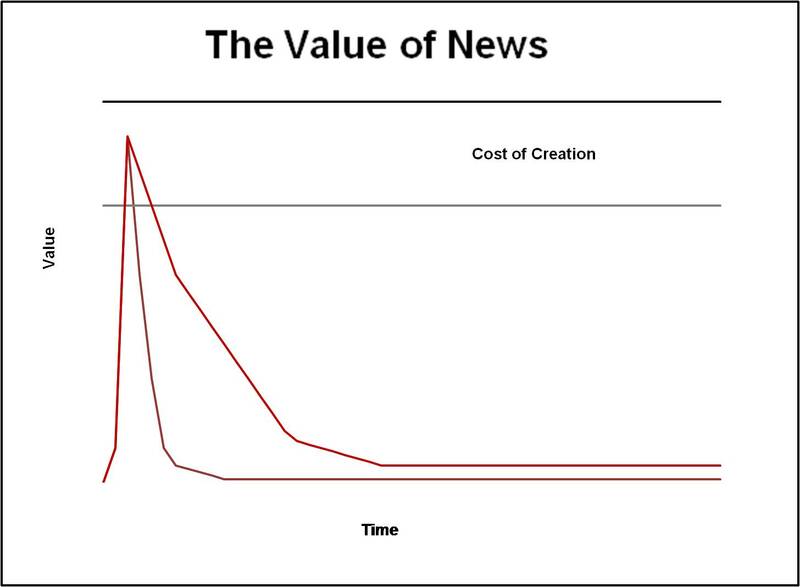 If structured journalism was a chart, what kind of chart would it be? Not a particularly pretty one, not least because I’m cobbling it together in Excel; nor a very scientific one. In fact, it’s mostly made-up. But that’s not the point: The idea is to show, graphically, how changing some of our processes and products might change the value of what we do – and hopefully provide some paths towards sustainability. Usually I just use a whiteboard or wave my hands about to illustrate these ideas; but here I have to actually draw something. So bear with me. So a key question is, how does this value compare to the cost of creating the story? That’s much better. We not only get back what we put in, but we get some incremental residual value as well. The problem, of course, is that that cost line is pretty constant, whether it’s high or low. We’re paying salaries and rent regardless of what the newsroom files (unless we’re Demand Media, who pay by the piece, but that’s another post. Or two.) So you can imagine what a newsroom does is file a series of these stories, some with higher spikes than others, with the goal being to have enough above the cost line so as to subsidize those below the cost line. In the good old days of robust print advertising, lots of stuff was above the cost line, mostly because ad revenues were high; in addition, we got huge cross-subsidies for all sorts of non-news content, such as classifieds. Now, of course, many of those cross-subsidies have been disaggregated away (thanks, Craig’s List) and online ad revenue isn’t anywhere as high as print was. 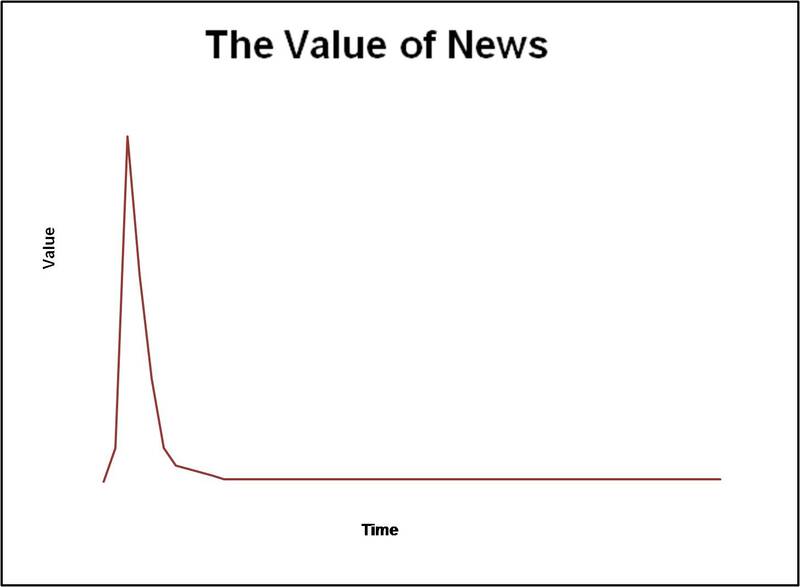 It’s unlikely we’re going to get that spike in value much higher. Online ad rates simply aren’t rising at a rate sufficient to offset print ad revenues. Subscription fees, while becoming more a part of the online experience, aren’t likely to generate huge numbers except in very specialized niches. There probably will be other revenue streams, but they haven’t materialized yet. We could work on bringing down the other line – the one on costs. And, to be sure, that’s what most media organizations have done. Lots of fat has been cut out everywhere; lots of meat and bone too. I’m sure there is more fat still out there, and we haven’t seen the end of cost-cutting and more efficiencies. But simply trying to cut your way to sustainability sets you up to compete on price in an environment with few barriers to entry. That’s a tough slog for anyone. That second, redder line, is the goal. In other words, let’s try to extend the shelf-life of what we do on a daily basis – that both increases its value on day two (or day forty-two), but if we set up the processes correctly, we might even be able to lower the cost of content creation. And if we go out of our way to collect even more information embedded in reporters’ brains – relationship data, times, dates, places, addresses, voting records, whatever – we can build powerful databases that link that information together and give it enduring value. If we track every car accident in the city, for example, by location, type of car, weather conditions or whatever, it allows us to show the most accident-prone corners in town when it rains early in the morning – value that is created simply by being diligent about collecting information regularly. The alternative, writing forgettable stories about every accident that go into an archive, creates hardly any value. And yet it takes essentially the same work to do both. 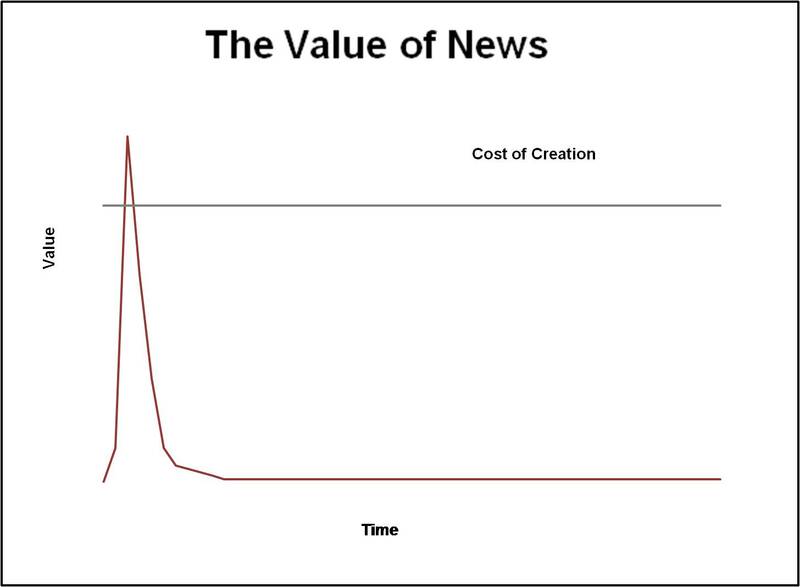 So the ideal in a structured journalism newsroom isn’t that the spikes are higher, but that the tails are fatter. Some costs also come down, and overall, the picture is one that – while it isn’t a magic bullet or the holy grail – gets us closer to building real value, in financial and public interest terms, at a manageable cost. One final note: Don’t nitpick the charts. I’m sure the slope of the curve should be different, or the cost line higher or lower. It’s conceptual. One day I’ll get back lesson 5 on Illustrator and learn to do these right. Thanks, really interesting articles. (I followed a link from Journalism.co.uk, btw.) Have you come up with a way to interrogate all this data to get anything meaningful from it? That would be my issue. Thanks, Chris. Depends a bit on what you mean by interrogating the data: Connected China (connectedchina.reuters.com) basically takes the data created by journalists and presents it back as a series of rich visualizations; Homicide Watch (homicidewatch.org) allows users to search and filter their data, and also use it to do their annual review. But there’s clearly more that can be done, if data is collected regularly. But not a lot of people are doing this. Yet.